Brownstone flat roofs are separated by parapet walls and chimneys. These walls and chimneys are smeared with tar to protect against leaking. This tar will eventually dry and crack, causing fissures that expand and create leaks. Instead of smearing tar on the walls and chimneys, as regular maintenance, we cover them with a Modified Bitumen Torch Down Rubber Membrane. This membrane will protect the walls and chimneys from leaking for the next 30 years. 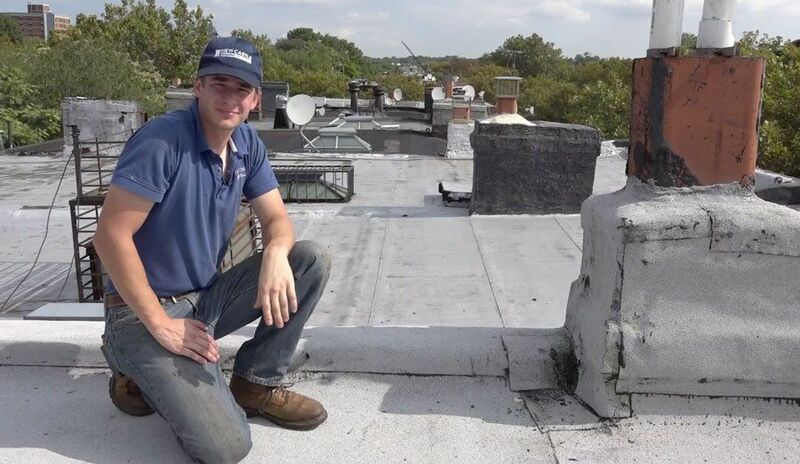 The conditions of most Brownstone roofs are fairly good because they have a Modified Bitumen Torch Down membrane, which is the type of membrane we specialize in when installing roofing. Another positive is that most of them are coated with aluminum asphalt paint for UV protection. Areas that may need attention, are the parapet walls, chimneys, skylights, and hatch doors, which can develop leaks due to improper flashing and transitions to the roof. If you are having leaking issues, or just need a new roof, you should not remove the existing roof, rather, the installation of a new Modified Bitumen rubber membrane over it, is best. We also advise that the 2-ply membrane with ceramic granules embedded for protection against harmful UV rays, be your first choice, as there was no mistaking the number of roofs we saw painted with an aluminum asphalt coating. This coating only lasts a few years, as protection from harmful sunlight. The image below shows 2 chimneys. The one in the foreground is wrapped with the same membrane as the roof. Here, there is no flashing between the chimney and the roof; it is a continuous membrane. The chimney in the background is covered with tar to seal it. The roof membrane stops at the base of the chimney. Over time, the tar will degrade and peel away and cause leaks. Above is a video of a hoist we made especially for accessing Brownstone rooftops in Brooklyn and Manhattan. The hoist makes getting roofing materials to the roof, easier and without having to go through the client’s living space. 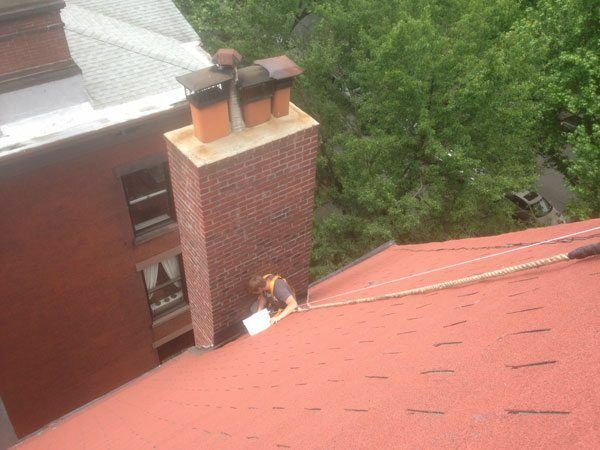 Currently, there are laws against using a torch to install new roofs, but not to repair one. It is best when 2 torch down membranes are fused together. It becomes a reinforced 2-ply membrane, able to withstand the elements for many years to come. The wall and chimney show that tar was smeared on them to seal them from water leaks. This is not something that will last because the tar will dry and crack. The best way to seal a chimney or wall is to cover it with a Modified Bitumen Rubber Membrane as you can see in the image above. Most of the chimneys in Manhattan and Brooklyn are smeared with tar. When the tar cracks, water will seep into those cracks. During the winter, the water will freeze inside these cracks and cause the mortar and the brick to crack, making it vulnerable to leaks that will come with the first thaw. 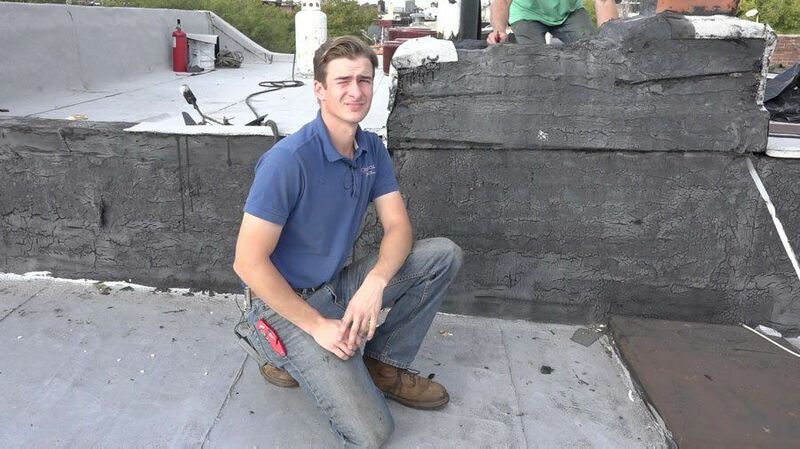 When it comes to parapet walls and chimneys on a Brownstone, the best way to repair them is to cover them with an MB rubber membrane. 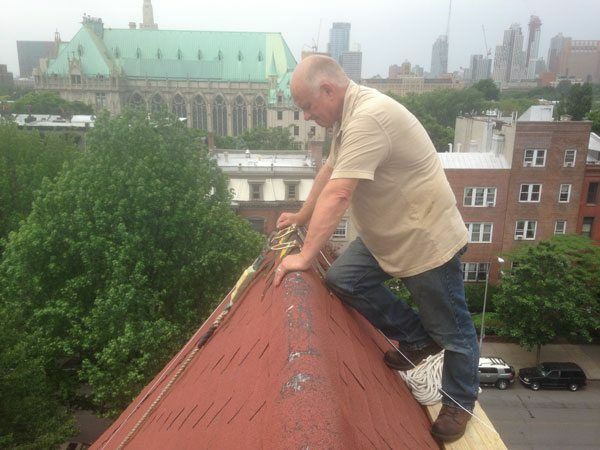 Repairing flashing on a Brownstone in Brooklyn, New York, sometimes requires us to climb and rappel using safety equipment. 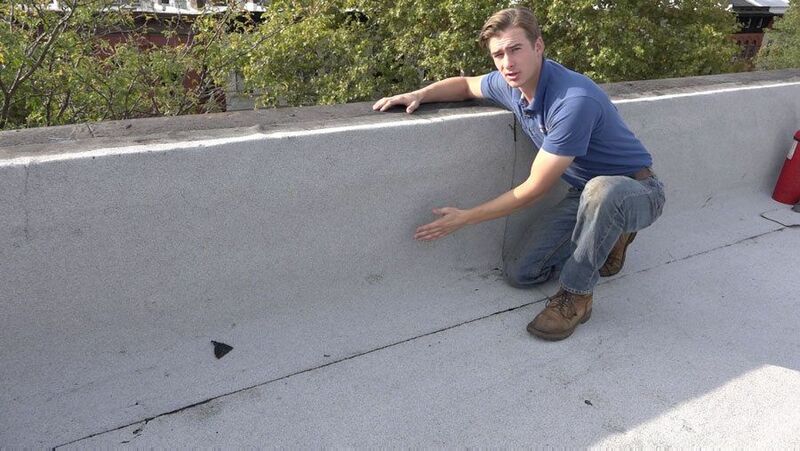 Instead of smearing tar to seal a parapet wall, we covered the wall with a Modified Bitumen roofing membrane. This is, by far, the best way to ensure that there will never be a leak between the wall and the roof.